Our product range can be divided into two main areas. The manufacture of technical parts from wood forms part of our core business. We work to your technical drawings to produce turned parts and milled parts as well as special turned parts in various sizes for any industrial purpose, all made from the most varied wood materials and with a wide variety of finishes. 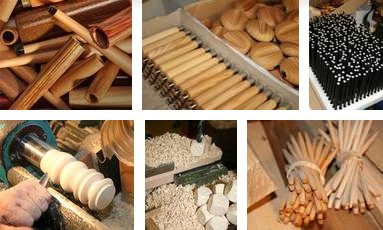 The production of writing instruments, the second part of our production range, is where our traditional focus lies. In line with technical advances, our emphasis has moved away from nib penholders and more towards wooden writing instruments such as clutch pencils in wood, ballpoint pens in wood, give-aways in wood and accessories for an attractive-looking desk. You can always find something new from us! Our team and many years of experience are at your service to implement your own ideas for your products.